That Santa Fe Go Club is a chapter of the American Go Association – the controlling body for amateur player ratings in the US. Go players have been meeting at St. John’s College for many years. 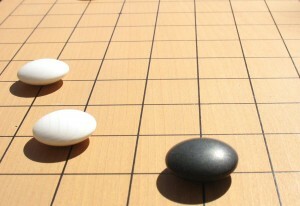 In 1998 the college was host to the US Go Congress – eight days of eating, drinking, sleeping and playing Go. Previously, you may have known us as the New Mexico Go Association. In 2010, we decided to bring a more local focus to club activities while still maintaining contact with go playing friends in other New Mexico locations. If you would like to support us financially please look at the options there are for donations – and thank you! Photos and images: Copyright 2010 by Robert Cordingley.